Being the leading distributor of firearms in Dutchess County, NY, we are proud to offer a valuable selection of vintage and collectible guns. We feature firearms from a wide range of history. From the Civil War, World War II, and decades like the 50’s or 60’s, our inventory is bound to have something it for every collector. 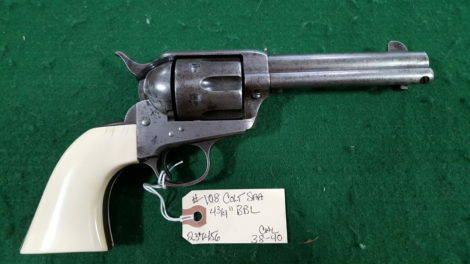 This month we are featuring the Colt SAA revolver. Colt is the most well-known name is firearms throughout the entire world. Sam Colt was serving as a seaman when he noticed how the mechanical workings of the ship he was on could also work for a firearm. He believed that the revolving cylinder concept would change the way the world looked at guns. While he was serving on the ship, Corvo, Colt carved the first design for the Colt revolver. In 1836, Colt opened his own plant and manufactured pocket, belt, and holster model pistols. Sales were not strong, and the plant closed in 1842, allowing Colt to focus on other inventions. Soon after that, units of the US Dragons and Texas rangers claimed that the success of their battles was due to Colt’s revolvers. Because of this, the US Army collaborated with Colt to design a new and more powerful revolver. Business boomed, and and by 1855, Colt’s Patent Fire Arms Manufacturing Company was up and running. Sam Colt became known as one of the wealthiest businessmen in America. By the time of his death is a862, he had produced over 400,000 firearms. The Colt Armory was left to his widow, Elizabeth. She maintained the brand and vowed for it to continue to grow. It did just that with the introduction of the Colt Single Action Army Revolver in 1873. This gun used self-contained metallic cartridges and became a major success. In fact, it wasn’t long before the SAA was known as “the gun that won the West”. This was because it was used by famous soldiers like General George Patton, and shooters like Buffalo Bill Cody. Teddy Roosevelt was even a big fan of the sleek revolver. The SAA was available in several variations, the 4 ¾ .38-.40 being one of the most popular. Operation of the SAA is smooth, which is a refinement of the earlier Colt percussion revolvers and the Colt 1871 cartridge revolver. The cylinder is mounted on a central axis and operated by a hand with a double finger. When the hammer is fully lowered, it rests within the frame. 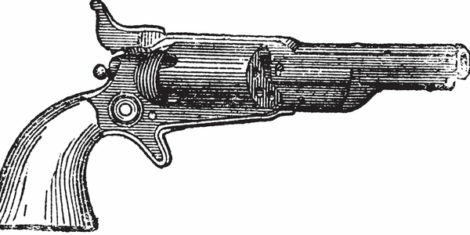 Much like the earlier percussion revolvers, the Single Action Army was designed to allow loading of all of the chambers. Many users of the SAA will leave one empty chamber under the hammer because a sharp blow could damage the mechanism and allow a fully loaded revolver to fire. East Coast Firearms proudly features a Colt 4 ¾ single action .38-.40. The revolver sports a pair of nicely fitted original vintage ivory grips and perfect screws. It is in perfect working condition and includes a copy of the factory letter. For more information on the Colt SAA, or any other of our featured guns inventory, please call or email East Coast Firearms anytime. We are happy to assist any firearm enthusiasts in enhancing their collections.